We have a business-oriented attitude to our financial solutions, which means that the solution at all times will create maximum value for our customers. At Matrix Support, we always tailor our financial solutions to the individual customer. Why? Because we know that all companies are different and it requires flexibility to create a good result. It is our experience that our comprehensive business know-how help us create great results for our customers. We can advise you about your company’s financial situation, if you wish. This means that you get insight into where you can optimize in the business, and we show you where to focus and where you should consider changing course. For us, honesty and transparency are two keywords that form the basis for our work. It is important for us that you have full confidence in our work. With honesty, we understand that our customers can always rely on the work we deliver. We comply with the agreed deadlines and are within our prices. You will therefore never experience incurred additional costs that go beyond our agreement. We are honest and comply with the fixed price that we have agreed in advance. With transparency, we mean that you as a customer can safely keep track of our work and the tasks we solve for you. With transparency, we mean that you as a customer can safely keep track of our work and the tasks we solve for you. If needed, we always do our best to explain the details of your business’s financial situation. Matrix Support is part of the Asgaard A/S Group. Through more than 20 years of experience, as business executives, we have become aware that a large number of companies spend too much effort on necessary and time-consuming tasks, thus gaining their core competencies. Our experience has given us the right skills to do business, so we can also help you with everything from administrative tasks, bookkeeping, accounts, VAT payments to payroll administration and much more. At Matrix Support we have both the professional skills and a broad experience in providing accounting, accounting, and other administrative and financial tasks. We have established many companies and know the different rules and practices, which enables us to help you if you are to create a new company. Our CEO, Martin Lampe, is one of the key players in the company. You can read about his professional expertise and background here. Our values ​​give us the ability to create good results for our customers, as well as a solid and trustworthy collaboration with each and every one. 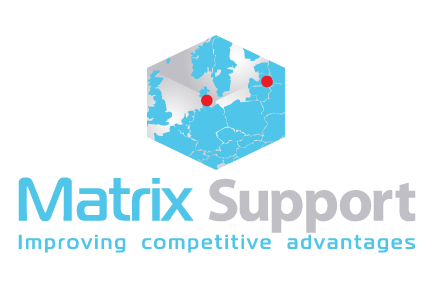 At Matrix Support we provide various business areas for both small and large companies. Find out how we can help your business by contacting us here.